It's also important to consider which products get a price increase. Think about this: If a food company has vegetables and ice cream in its stable of products, which one should get a price increase? The ice cream. Everyone, even people who are financially strapped, needs staples, so it's important not to price them out of reach. On the other hand, indulgences like ice cream, cookies and cosmetics are discretionary purchases, so people tend to be less price-sensitive when they buy them. So says The Journal: when the time comes to raise prices, companies should raise prices more on goods that people do not need (like ice cream) in order to keep prices low on staples (like veggies). And, this is obvious. I mean -- just think about it. OK. Let's think about it. Let's make an assumption that there are two goods in the world: nutrition and treats. People need nutrition, but they don't really need treats. Thus, if you raise the price of treats and nutrition by one percent, people will tend to cut back on treats more than they cut back on nutrition. This is precisely the opposite of the article's claim. The own-price elasticities from the uncompensated demand ranged from -1.00 for bulk ice cream to -1.28 for ice milk or sherbet to -1.96 for ice cream novelties. Similar to our study, the own-price elasticities of Maynard and Venkat Narayanan (2002) for ice cream (-1.30), sherbet (-1.43), branded frozen novelties (-2.39), and private label frozen novelties (-1.59) were all elastic and close in magnitude. Let me translate. When you raise the price of ice cream by one percent, the quantity of ice cream that consumers want falls by more than one percent regardless of which category of ice cream is considered. Moreover, fancier varieties of ice cream (i.e., branded frozen novelties) have more price sensitive consumers. So, ice cream has price sensitive consumers. How about vegetables? On this point, here's a post by Matt Yglesias. The graphic is most interesting, so I'll reproduce it here. The elasticities on the figure are quite a bit smaller than -1 (my version is blurry, but the Yglesias has a clearer figure). 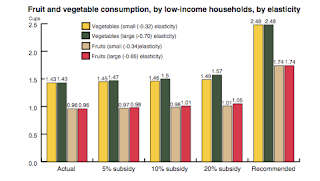 Notably, fruits and veggies have inelastic demand (ranging from -0.32 to -0.70), which dooms public policy that is designed to get us to eat our fruits and veggies. 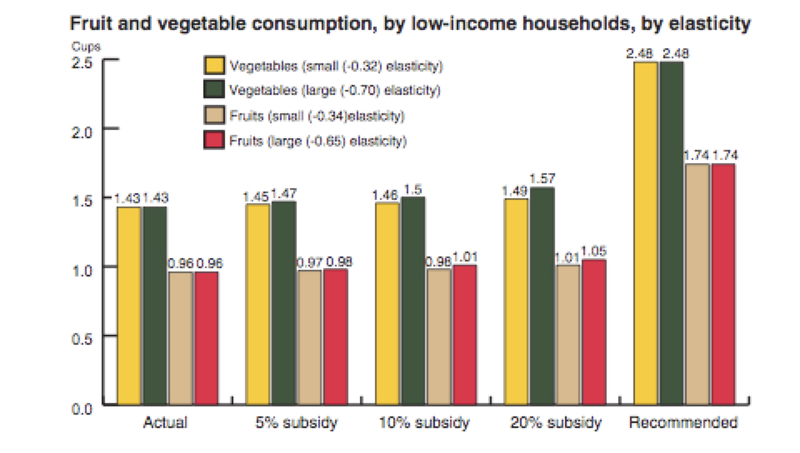 That doesn't stop policymakers from trying to subsidize us to eat more fruits and veggies, but it is a difficult course of action. Back to The Journal's article, the author gets the price sensitivity of consumers to ice cream versus veggies exactly wrong. And, this isn't rounding error. If we look at the best estimates of what consumers do, consumers of ice cream are more than three times more price sensitive than consumers of vegetables. Now, what does this say about optimal pricing for the company that sells only ice cream and vegetables? Not much, actually. The elasticities I've reported are aggregate market elasticities. Firms have another set of considerations to worry about; namely, competition. If Firm A raises prices, do competing firms do the same? Are there close competitors in the ice cream market... in the vegetable market? This depends critically on how well-differentiated the firm's products are from the competition. One possibility: the vegetable market is much more competitive than the ice cream market. I suspect this is true. This is more casual introspection than reliance on numbers, but it seems to me that brand matters a lot more in the ice cream market than it does for vegetables. Thus, competition is likely more fierce for consumers of vegetables. Hence, the company that sells both veggies and ice cream may want to raise prices on ice cream, but not because consumers are more price sensitive to the product category (and hence, will be priced "out of reach" as the article describes), but because the market for staples tends to be more competitive. If the time comes to raise prices, I might recommend raising prices on veggies (the article's casual conclusion), but my reasoning is dramatically different and points to a key deficiency in the article. It is the vicious hand of competition - not customer affordability - that makes it unwise to raise prices on vegetables rather than ice cream. Other firms and how they compete matters a lot, and this is too often overlooked in advice on how to price. I saw this article this morning was going to comment on the same things, but you beat me to it! The level of competition and industry versus company elasticities is an important point. As an industry, demand for veggies can be inelastic and ice cream elastic, but if the market for veggies is perfectly competitive while the market for ice cream is not, then the demand facing a veggie farm is perfectly elastic while the demand facing an ice cream firm is relatively inelastic. The ice cream firm will have pricing power, while the veggie farm will not.